Kamagra Gold without prescription, Zoloft reviews. FILE – People protest the killing of more than 20 people and the displacement of residents in Burayu town, at Meskel Square in Addis Ababa, Ethiopia, Sept. 17, 2018. 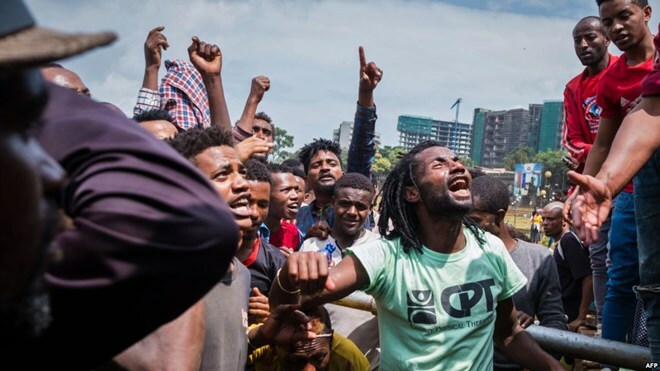 When dozens of people died in ethnic clashes last month on the outskirts of Ethiopiaa��s capital, Addis Ababa, protesters took to the streets. The government, meanwhile, turned off the internet.Mobile internet service stayed off for about 40 hours. It was the second time this year the internet has gone down in Ethiopia during times of unrest, in addition to a months-long outage that began last year during protests that led to the resignation of former Prime Minister Hailemariam Desalegn. Officials have yet to explain this latest outage, but activists and journalists believe the typical justification, to ensure public safety in turbulent times, doesna��t hold up to scrutiny. Theya��re also concerned that the government continues to suppress information and impede journalists, even in the midst of wide-reaching reforms. a�?Restricting the internet has repercussions on freedom of expression, access to information and freedom of speech,a�? Muthoki Mumo, the sub-Saharan Africa representative for the Committee to Protect Journalists, told VOA. For Mumo, the two recent shutdowns suggest a worrying trend. a�?Both shutdowns have happened during a time of, during periods of, political tension,a�? Mumo said. Official explanations of internet shutdowns often highlight the danger of allowing information, and misinformation, to flow freely when ethnic tensions flare and reprisal killings are more likely.Atnafu Berhane, an Ethiopian blogger and a co-founder of the Zone9 blogging collective, told VOA that concerns about misinformation are justified, but internet shutdowns arena��t the solution. a�?To control this misinformation, law enforcement have to do their job according to the law. But in experience, laws have been used to target activists and politicians,a�? Atnafu told VOA. Journalistic, economic impacts Brand Viagra buy online, lioresal reviews. Ethiopiaa��s internet penetration rate stands at just 15.4 percent, one of the lowest rates in the world, according toA�Freedom House, a watchdog group focused on freedom of expression and the press. But many more people have at least limited internet access through mobile devices, and shutdowns can affect their ability to communicate and stay informed. a�?I have to communicate, or [am] forced to communicate, information through direct phone, which the government can easily tap and can use it to prosecute human rights activists,a�? Atnafu said. Economic concerns have also been raised in connection to outages. ByA�some estimates, internet blackouts cost Ethiopia in excess of $3.5 million a day. a�?Most of the time, Oromia or Amhara region were targeted, especially in the Oromia region we had internet shutdown for so long,a�? Atnafu said. Atnafu believes the government is more interested in controlling information thata��s true, yet potentially embarrassing, than misinformation. a�?There was no misinformation. They just shut it down. People were targeted and shot due to demonstration, and we have seen photos of protesters dying on the floor,a�? Atnafu said. a�?They were controlling those kinds of information from streaming on social media, not misinformation.a�? Mumo believes therea��s reason to be optimistic. a�?Since the new prime minister came into power, wea��ve seen some very positive developments in Ethiopia,a�? she said. a�?We are urging the government to ensure that citizens have access to the internet at all times, especially in times of crisis, when information is so crucial,a�? she said. buy Cialis soft FRUIT, buy zithromax online.